Twistin' A New One I'm a former balloon decorator who has dabbled in twisting for the past 20 years. I would be happy to find someone who shares my love of balloons and creativity. Does radar5012 belong in this group? 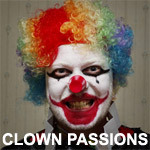 LOVE MWUH CLOWNS XOXOXOX I LOVE CLOWNS, I SHALL MARRY ONE SOMEDAY. Does stfuromany4 belong in this group?